Earache is a common problem in both adults and children and is usually nothing serious. A minor infection is usually the underlying cause of pain and it goes away in a few days without treatment. Sometimes, the pain can be quite sharp and burning and becomes severe when you swallow. It may affect one or both ears. My Ear Hurts When I Swallow, Why? There is a connection between your throat and ear through the nervous system, so it is possible to experience pain because you have a bad throat. Here are some of the common causes of pain in your ear. An excess buildup of earwax or a foreign object stuck inside the ear can lead to earache. Never try to remove anything inside you or your child's ear; you may end up pushing it further and causing damage to the eardrum. Try eardrops to soften earwax and help it fall out naturally. 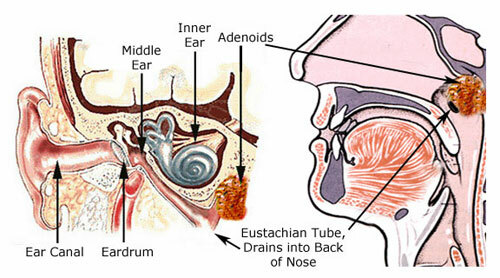 The Eustachian tubes develop a link between the back of your throat and your middle ear. The tubes are responsible for regulating pressure and mucus drainage. The tubes may swell due to infections, leaving less space for mucus to drain out. The excess mucus will accumulate and provide a perfect environment for bacterial growth. Ear infections in the middle ear are quite common in children. Try decongestants to help clear any blockage in the Eustachian tube, but you may have to use antibiotics to clear your infections completely. If you say, "My ear hurts when I swallow" and you experience some of the following symptoms, the chances are you have developed a severe ear infection. As mentioned already, you may have an ear infection causing severe pain in your ear even when you swallow something. You should go see your doctor for an accurate diagnosis. You should call your doctor immediately if ear pain is severe, symptoms don't improve after 24 hours, your toddler is sleepless, and you notice a discharge of puss, fluid, or blood from the ear. It refers to the inflammation of the ear canal. Swimmer' ear affects the outer ear when water stays in the ear after swimming, especially in oceans and lakes. This leads to the development of an infection, which causes severe pain in the ear, even when it is pulled or touched. If you say ear hurts when I swallow and you have a throat irritation as well, this could be due to swimmer's ear. A throat infection can also cause pain in the ears, which is mainly due to the connection between ears and throat through the cranial nerves and the Eustachian tubes. Sore throat is usually the outcome of a viral infection, and the treatment will involve improving your symptoms only. If it is a bacterial infection like strep throat, you will require antibiotics. Caused by bacterial or viral infections, tonsillitis leads to the inflammation of the tonsils and produces many symptoms of sore throat, including ear pain when swallowing. Antibiotics will work against bacterial infections, but OTC medications may also help ease symptoms of tonsillitis. Factors like overuse of the vocal chords, infections, and excessive smoking can also lead to an inflammation of the larynx. You may experience a loss or hoarseness of voice with several other symptoms associated with cold or flu. Laryngitis will make it difficult to swallow anything and may even cause ear pain. What's causing laryngitis in your case will help determine the most appropriate treatment option. Also called Otitis media with effusion (OME), glue ear refers to the buildup of fluid inside your ear, which may even cause temporary hearing loss. You don't usually feel a lot of pain, but the fluid pressure can cause earache. The issue usually resolves on its own, but may take up to a month or so. Your doctor may recommend placing small tubes called grommets in your ear if the problem persists for long. Why my ear hurts when I swallow? It could be due to some ear damage caused by an injury to the inside of the ear. You may end up hurting your ear while scraping earwax. Poking a cotton bud too far into your ear may puncture the eardrum and cause severe pain. The ear canal is highly sensitive and you can damage it easily. It usually heals on its own, but you may have to wait for up to a couple of months for a perforated eardrum to heal completely. The condition refers to the excess buildup of pus in your gums or teeth, which happens due to a bacterial infection. You may experience intense and throbbing pain in your affected tooth. Visit your dentist as soon as possible to remove the abscess – your dentist will also drain the pus to alleviate pain. Ear Hurts When I Swallow: What to Do? Apply a warm compress over the affected ear to help reduce pain. Placing a warm flannel against your ear may also help. Use OTC acetaminophen or ibuprofen to relieve pain. Don't give aspirin to children because it may cause Reye's syndrome. Children recovering from flu-like symptoms or chickenpox should avoid aspirin. Try prescription eardrops, such as Aurodex for additional pain relief. They work when eardrum is not perforated or torn. Avoid using Aurodex in children younger than age 2 to prevent complications.